As a modern developer, you may be eager to build your own deep learning models but aren’t quite sure where to start. If this is you, I recommend you take a look at the deep learning course from fast.ai. This new fast.ai course helps software developers start building their own state-of-the-art deep learning models. Developers who complete this fast.ai course will become proficient in deep learning techniques in multiple domains including computer vision, natural language processing, recommender algorithms, and tabular data. You’ll also want to learn about Microsoft’s Azure Data Science Virtual Machine (DSVM). Azure DSVM empowers developers like you with the tools you need to be productive with this fast.ai course today on Azure, with virtually no setup required. Using fast cloud-based GPU virtual machines (VMs), at the most competitive rates, Azure DSVM saves you time that would otherwise be spent in installation, configuration, and waiting for deep learning models to train. Here is how you can effectively run the fast.ai course examples on Azure. While there are several ways in which you can use Azure for your deep learning course, one of the easiest ways is to leverage Azure Data Science Virtual Machine (DSVM). Azure DSVM is a family of virtual machine (VM) images that are pre-configured with a rich curated set of tools and frameworks for data science, deep learning, and machine learning. Using Azure DSVM, you can utilize tools like Jupyter notebooks and necessary drivers to run on powerful GPUs. In result saving time that would otherwise be spent installing, configuring, and troubleshooting any compatibility issues on your system. Azure DSVM is offered on both Linux and Windows editions. Azure VMs provides a neat extension mechanism that the DSVM can leverage, allowing you to automatically configure your VM to your needs. Microsoft provides an extension to the DSVM specifically for the fast.ai course, making the process so simple you can answer a couple of questions and get your own instance of DSVM provisioned in a few minutes. 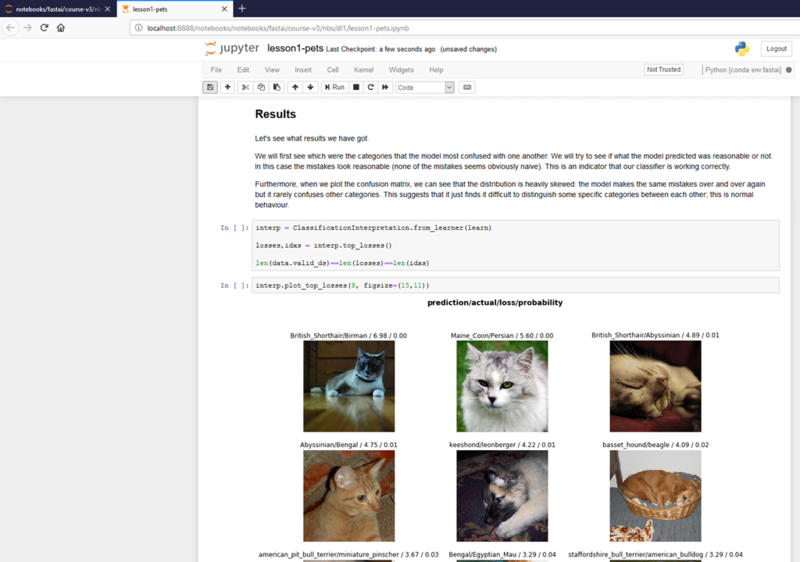 The fast.ai extension installs all the necessary libraries you need to run the course Jupyter notebooks and also pull down the latest course notebooks from the fast.ai GitHub repository. So in a very short time, you’ll be ready to start running your course samples. If you don’t have an Azure subscription you can start off with a free trial subscription to explore any Azure service for 30 days and access to a set of popular services free for 12 months. Please note that free trial subscriptions do not give access to GPU resources. For GPU access, you need to sign up for an Azure pay-as-you-go subscription or use the Azure credits from the Visual Studio subscriptions if you have one. Once you have created your subscription, you can login to the Azure portal. You can now create a DSVM with the fast.ai extension by selecting one of the links below. Choose one depending on whether you prefer a Windows or a Linux environment for your course. After answering a few simple questions in the deployment form, your VM is created in about five to 10 minutes and is pre-configured with everything you need to run the fast.ai course. While creating the DSVM, you can choose between a GPU-based or a CPU-only instance of the DSVM. A GPU instance will drastically cut down execution times when training deep learning models. This is largely what the course notebooks covers, so I recommend a GPU instance. Azure also offers low-priority instances including GPU at a significant discount which is as much as 80 percent on compute usage charges compared to standard instances. Though keep in mind, they can be preempted and deallocated from your subscription at any time depending on factors like the demand for these resources. If you want to take advantage of the deep discount, you can create preemptable Linux DSVM instance with the fast.ai extension. Once you have created your DSVM instance, you can immediately start using it to run all the code in the course examples by accessing Jupyter and the course notebooks that are preloaded in the DSVM. You can find more information on how to get started with fast.ai for Azure on the course documentation page. You can continue your journey in machine learning and data science by taking a look at the Azure Machine Learning service which enables you to track your experiments. You can also use automated machine learning, build custom models, and deploy machine learning, deep learning models, or pipelines in production at scale with several sample notebooks that are pre-built in the DSVM. You can also find additional learning resources on Microsoft’s AI School and LearnAnalytics. I look forward to your feedback and questions on the fast.ai forums or on Stack Overflow.